Global fund managers are most bullish on stocks and cyclicals at the moment, but staying away from South-east Asia, according to a survey by Bank of America Merrill Lynch. Expectations have also improved for corporate profits amid better outlooks for economies, according to the bank's global fund manager survey, which was carried out between Dec 6 and 12. Globally, the survey reflected improved sentiment about the months ahead. The proportion of investors who expected a better global economy rose to a net 71 per cent in December compared to 67 per cent in November. A year ago, the bulls formed only 40 per cent of the responses. About 41 per cent of the fund managers saw improved corporate profits in 2014, compared to 11 per cent a year ago. About 55 per cent of investors wanted companies to prioritise capital expenditure. Equity allocations increased by two percentage points to net 54 per cent overweight in December, about one standard deviation above its 10-year average. In terms of investment ideas, the most popular trades in December were short Japanese yen, long S&P 500 and long US high-yields. The top contrarian trades were to be long bonds, long Brazil and long consumer staples. The strong consensus for some of the most popular trades could leave them vulnerable to disappointments and profit-taking. "Weakness in the US dollar next year is the biggest threat to positioning given a consensus to go long Japanese and European cyclicals," Michael Hartnett, chief investment strategist at BofA Merrill Lynch Global Research, said in a statement. John Bilton, the bank's European investment strategist, added: "Belief in the European recovery has reached a stretched level, leaving markets vulnerable to profit-taking as portfolio managers seek uncrowded alternatives." Just 11 per cent of respondents expected the US Federal Reserve to taper quantitative easing this week. The Fed was expected to announce its decision overnight. In Asia, Korea, Taiwan and China remained the most attractive markets, while sentiment remained cool for South-east Asia. There were some outliers, however. The Philippines, for example, saw sentiment swing positive over the past month as the country began to settle after November's Typhoon Haiyan. Thailand, however, fell out of favour amid political protests. 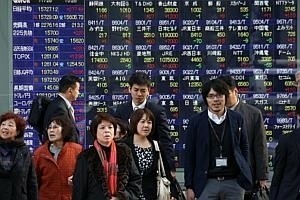 Singapore fell in neutral territory among Asia-Pacific investors, with no strong conviction for over- or underweighting. In a recent outlook report, Bank of Singapore argued that Singapore equities were preferred in South-east Asia, citing decent valuations and exposure to developed market growth. "Improving global growth momentum driven by developed markets is expected to bring a rosier picture for Singapore," Bank of Singapore wrote. "As such, we maintain our preference for Singapore equities within South-east Asia, as corporate earnings momentum is poised to improve to +9 per cent." Cyclical sectors such as industrials, retail, cars and technology are the preferred targets for investors in Asia. Defensives such as financials, consumer staples, basic materials and utilities, however, remained consensus underweights.